beherenail: Stop. Stepping. On. My. Hyacinths. Hey look, I have a blog now! Remember when I made that tutorial video like three months ago and said this was coming soon?! Yeah, sorry about that. I guess I should work on more tutorial videos next but for now, let's talk about this here blog. You guys know I love to go on about nail polish and Instagram was cramping my style. I want to share a bit more with you guys when it comes to the quantity and variety of my content. I will be getting into the products I love a bit more here, as well as sharing extra photos and maybe even a little bit more of my nail tech experience! I promise to keep it interesting for you. I know stuff like this is extremely slow going at first and it's a lot to ask anyone to take the time to read a blog these days, so thanks if you have gotten this far! I have something special to share with you. 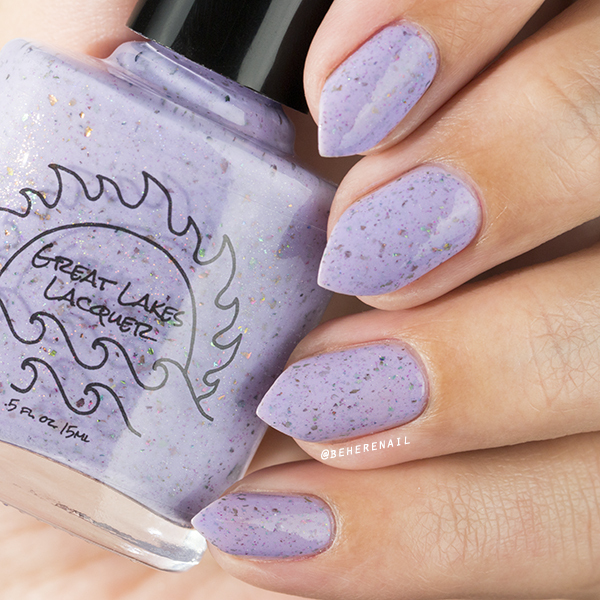 If you have been following me on Instagram you know my giveaway sponsored by Great Lakes Lacquer is coming to a close tonight and I really wanted to find a way to express my gratitude to Mariah for helping me share the gorgeous with you. Recently I placed a small order for a couple of my favorites from the April limited editions she has up right now. I chose Out Like a Lion and Stop. Stepping. On. My. Hyacinths. I love the names and both of these flake loaded crellies, but I noticed in the description for S.S.O.M.H. 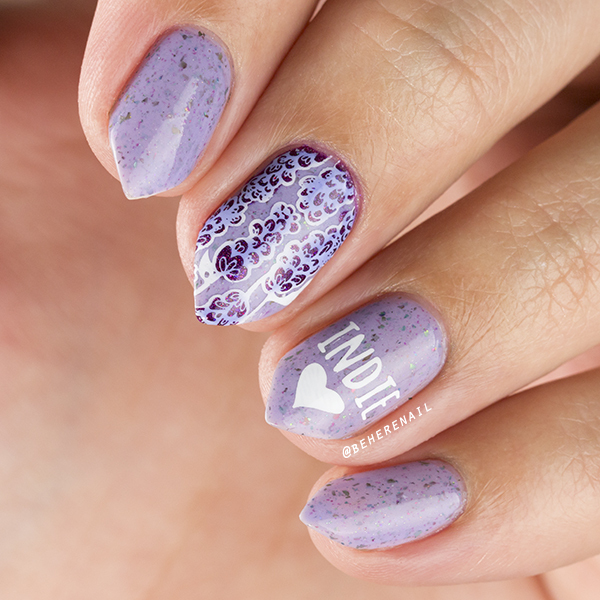 that hyacinths were her favorite flower, so I found the only hyacinth looking image in my stamping plate collection and did this mani for her! I am wearing it on my nails with a huge smile, because Mariah's sweetness and generosity toward my little account warms my heart. Hope you guys enjoy my blog. I am overwhelmed by your love and support and as such, I am parkin' it right here with you nail girls. I found my people. Yay congrats on your blog! It is more fun isn't it? I have so much to say about nails! 😂 I followed your blog on my Feedly. Love your writing style. Thanks for coming to see me here! Thanks for following, it's good to know other people aside from myself and my sister are reading what I have to say :D And thank you for the compliment, that really means a lot to me! So glad to hear it! You're more than welcome, I'm just exceptionally excited about pretty things made by nice people. 😉 I have a lot of cool stuff planned for the site, and it's going to grow with me. Thanks for following. Hello Justine! Great start to your blog hun. I love this colour polish. I'm definitely intrigued by this brand.